The Tear Film BREAK-UP TIME (BUT) is one of the most important functional tear film parameters. It describes the time, measured in seconds, how long the pre-corneal tear film is stable and thus intact until eventually the first rupture occurs and exposes a part of the ocular surface epithelium. As discussed in the chapters on ´Ocular Surface´ and ´Tears and Tear Film´ a FILM of tears is the ultimate pre-requisite for the preservation of ocular surface integrity because a FILM of tears is not only necessary for intact visual acuity but also to make sure that moisture is present at the ocular surface everytime and everywhere. When the Tear Film BREAK-UP Time (BUT) is estimated conventionally, the vital stain FLUORESCEIN is used to make the tear film visible in order to see its Break-Up - this is termed Fluorescent BUT (F-BUT). A Break-Up typically occurs in a small area and quickly becomes larger. In the region of the Break-Up the epithelial cells are exposed to the ambient air and are prone to dry out. The exposure of the epithelium is immediately sensed by the sensory nerves and initiates an eye blink to remove the old ruptured tear film and to spread a new one. Classically the integrity of the tear film is tested by applying a vital stain (typically Fluorescein used for a FLUO-BUT) to make it visible in the slit lamp. The Fluorescein is typically given as a drop from a bottle and the advantage is, that this technique is easy to perform and reasonably reliable. The additional volume and the presence of a staining substance both already influences the stability of the tear film that is intended to be measured. What is measured is therefore not the ´real´ tear film stability but a surrogate parameter with a systematic error. If, however, the parameters are closely standardized by a specified amount of stain and of very limited volume of added solution, the ´ordinary FLUO-BUT´ will be quite reliable. TOPOGRAPHERS are Multi-Purpose devices that are stand-alone, are typically equipped with different illumination systems for different purposes and are connected to a computer with an appropriate software system for evaluation and storage of examination results. Certainly very useful for Dry Eye Diagnostics is the possibility to perform Non -Invasive Tear Film Break-Up (NI-BUT) measurements that allow the measurement of Tear Film stability without interfering with it by addition of marker any substances. NON-Invasive BUT (NI-BUT) offers all the advantages that are missing in the conventional Fluo-BUT. It requires, however, a special equipment that allows monitoring of the tear film lipid layer by interferometry and therefore allows to see a disruption of the tear film without any additional staining or other modification of the tear film. The necessary equipment is typically a TOPOGRAPHER as already described above for the monitoring of lid and blinking dysfunction (LBD). The necessity of a topographer is no major disadvantage because these very versatile machines are anyway almost indispensable for an up-to-date Ocular Surface and Dry Eye Specialist. As can be assumed, a totally unaltered tear film has a different break-up time, as evaluated in NI-BUT, compared to a tear film that is already altered by addition of an aqueous solution including a staining substance, which is typically fluorescein (F-BUT). Indeed the measured NI-BUT is typically longer than the respective F-BUT in the same patient. NI-BUT therefore has different normal values compared to the conventional F-BUT and this must be kept in mind when BUT values in different patients are compared that were probably made with different techniques or when different BUT values in the same patient are compared over time that were probably evaluated with different techniques. The view of pro-ocular Tear FILM as a basically three layered liquid film is the leading concept for roughly the last 70 years since Eugene WOLFFS original description in 1946 ... and this concept still appears to hold true. The superficial layer or phase of the tear film is composed of LIPIDS that have, according to the present knowledge, mainly the function to retard the evaporation of the underlying aqueous main phase of the tears. It may also contribute to other functions such as e.g. to aid in spreading of the tears into a thin film. The aqueous phase from the main and accessory lacrimal glands is towards the underlying epithelium conceivably increasingly mixed with secreted gel-forming mucins from the goblet cells. Altogether this leads to the present concept of the tear film as a more or less three-layered structure which dates back basically to the times of Eugene WOLFF who explained this concept in 1946 ... in a time when probably not too many people were too much interested in such questions. The superficial layer of the tear film is composed of lipids with possibly some minor amounts of associated proteins. The lipid film is very thin but is still conceptually separated into a much thicker outer layer of non-polar lipids that appear to represent the ´lid on the pot of warm tears´ that retards aqueous evaporation. Underneath is a much thinner sub-layer of non-polar lipids, possibly with minor contents of proteins, that can connect the above layer to the underlying aqueous phase. The lipid layer is very thin ... in the area of about 100 nanometers (nm) - which is only approximately 10 times the thickness of a cell membrane. Still it appears to be composed of two sub-layers. The outside thicker sub-layer appears composed of non-polar and thus hydrophobic lipidsThe outside thicker sub-layer appears composed of non-polar and thus hydrophobic lipids which leads to the problem, or should we better say challenge (? ), that these lipids cannot bind to the underlying water in order to be held in place and to form a sufficiently homogeneous layer, that is necessary for perfect refraction of the incoming light and thus for a sharp vision ... or perfect visual acuity. Therefore, an inside connecting layer of lipids is necessary that can bind to its lipid mates at the surface but also to the underlying water. There are also some candidate proteins that may help in this function of binding hydrophobic lipids to an underlying water phase. The schematic representation of a normal tear film lipid layer in INTERFEROMETRY shows a whirly pattern of reddish-golden interference colors. The interference is typically best seen when the room light is dimmed. A real normal interference image is shown a few images below. The estimation or measurement of the amount of tear film lipids translates, as they are supposed to form a homogeneous layer, into the measurement of the thickness of the tear film LIPID LAYER. Measuring the thickness of the lipid layer is luckily easier than the estimation of the total thickness of the tear film that has shown a large variation of findings over the years. The reason why the estimation of lipid layer thickness is easier is based on the fact that its very narrow dimension are in the range of about 100nm. Structures in these very narrow dimensions lead to the formation of so called interference colors when the layer is illuminated with a suitable light, which can be stray light. Very well known are the typical colors of soap bubbles that are based on the same phenomenon. Another feature of a TFLL in interferometry is that the lipid layer tends to fold in a plicated fashion in the down-stroke of a blink ... and unfolds again in much the same shape during the up-stroke. Suitable illumination produces the typical interference colors from gray over yellowish-red to gold that we can see e.g. on an oil slick on a puddle of water along the street. Other individuals who do tissue sectioning for electron microscopy may know these colors from the light interference that a similarly ´ultra-thin´ section produces. In ultra-thin sectioning the interference colors are used to estimate the thickness quite exactly and the same can be applied to measure the thickness of the tear film lipid layer. The Analysis of the Tear Film LIPID LAYER (TFLL) by INTERFEROMETRY is already available since the 1980s by a simple to use handheld device - the TearScope, that was invented by the Tear Film Specialist Jean-Pierre GUILLON. Apart from estimating the thickness of the Lipid Layer it is also possible to obtain the Non-Invasive Tear Film BREAK-UP Time (NI-BUT). In theory is is possible to make the interference colors of the TFLL visible with an ordinary slit-lamp when the illumination is manually adapted in order to produce sufficient stray light to be able to see a glimpse of what the interference may look like ... but this procedure is typically not very exact and not very satisfying. The first practically usable device appears to be the TearScope (produced by Keeler Inc.). This is a hand-held device that was developed by Jean-Pierre GUILLON in the mid 1980s and introduced at the legendary Lubbock, Texas, Tear Film & Dry Eye Congress in 1984. The Tear Scope allows to study the tear film and its lipid layer in much detail. Some years later a improved TearScope ´Plus´ version was developed. The general interest in the tear film lipid layer was however limited during that time and later so that too few instruments were sold world-wide and later the production was stopped. With the advent of increased interest in Meibomian Gland Dysfunction (MGD) and Tear Film LIPIDS a new ´ADVANCED TearScope´ became available. This is up-to-date and thus allows to connect to a mobile tablet computer in order to record and document the obtained data which is certainly of advantage for a seamless integration into the clinical workflow. A very exact ANALYSIS of the Tear Film LIPID LAYER is possible by the LipiVIEW and the LipiSCAN devices (from TearScience Inc.). The interferenceimage is optained over a wide area and is automatically analysed. Over a time of approximately 30 seconds various parameters are measured such as the minimal, maximal and median Thickness of the Lipid Layer and in addition the Blinks are recorded in order to see partial blinks. The devices can also analyse the morphology of the Meibobmian glands by non-contact MEOBIGRAPHY. Another interferometer was about 20 years later also developed by a dedicated clinical specialist for the Tear Film Lipid Layer - this was Donald KORB. Korb and colleagues developed the instrument in the clinical practice according to the practical needs of the clinician. The goal was to develop an instrument that reveals the highest standards of imaging quality in order to achieve the greatest exactness in measurement combined with best convenience in usage and documentations of results in order to fit in seamlessly into the practical clinical schedule. This device was later produced by the company TearScience under the name Lipiview. In addition, this machine can also perform Meibography with immaculate perfection as will be discussed in the chapter for Meibography. The Lipiview automatically records the tear film lipid layer over a wide field of view in a movie, records the eye blinks including partial blinks and performs fully automated analysis of the data that can be printed out in a report (please see image). Legend: The interferometric image of the tear film lipid layer, produced here with the TearScience Lipiview, shows that a tear film with normal thickness has a mixture of interference colors that are mainly reddish-golden (upper image). This is equivalent to an average thickness of 90 nanometers. The lipid layer in the lower image is too narrow as can be detected by the grey interference ´color´ - the automatic measurement reveals an average thickness of 35 nanometers. The development of the Lipiview device fell into the period when it was eventually recognized that a deficiency of the Tear Film Lipids is the main causative factor for Dry Eye Disease in the vast majority of patients. This refers to about 4 out of 5 Dry Eye Patients who suffer from this primary cause and underlines that analysis of the tear film lipid layer represents and important and necessary component of a meaningful ocular surface investigation. The main reason for lipid deficiency, as evaluated by the TFOS MGD Report (freely available at: www.tearfilm.org) is the obstructive Dysfunction of the Meibomian Glands, termed Meibomian Gland Dysfunction, and mostly abbreviated as MGD). Since the TFOS MGD Report in 2011, the interest in the Tear Film Lipid Layer (TFLL) has rightfully almost exploded which has lead to the development of several new and convenient devices for tear film and TFLL analysis. This development has made the important Diagnostics of Tear Film and TFLL available to every clinician who is concerned with the Ocular Surface. Ocular Surface conditions with a deficiency ("lack") of tear film lipids have a a deficient Tear Film Lipid Layer (TFLL) and result in a loss of the water evaporation retarding effect. The water of the aqueous tears evaporates then (blue undulated arrows) rapidly but leaves the solved salts and functional proteins (both shown here as white particles) in the remaining tear fluid. The consequence is that (1) the tear volume decreases which causes a lower tear meniscus height (please see there) and decreased lubrication. In addition (2) in the remaining tear fluid the dissolved salts and hydrophilic proteins are more concentrated (relatively more particles per volume) so that the tears are ´hyper-osmolar´. These tears exert a ´hyper-osmolar´water-dragging stress onto the underlying epithelial cells, which represents an inflammatory stimulus and may contribute to the onset of cell damage and potentially to Dry Eye Disease when the condition becomes chronic. As we now know very well, the Osmolarity of the Tears may typically increase in that type of Dry Eye Disease that occurs due to a quantitative or qualitative deficiency of the tear film lipids. Lipid Deficiency occurs typically due toobstructive Meibomian Gland Dysfunction (MGD). In lipid deficient conditions the evaporation-retarding effect of the tear film lipid layer is impaired to different degrees that depend on the severity of the causative MGD. Increasing inability to retard the evaporation of the aqueous main phase of the tears leads to hyper-evaporation of the tear water and thus to increasing osmolarity of the remaining tear fluid. The reason is, that only the tear water evaporates like the water steam from a boiling pot of soup ... which leaves the rest more and more concentrated and thus, in the case of soup, increasingly salty. INCREASED OSMOLARITY (Hyper-Osmolarity) draws that water out of the epithelial cells of the ocular surface by osmotic forces. The osmotic stress represents a danger signal for them and induces, via gene regulation, the production of inflammatory cytokines that mount an inflammatory reaction. This type of reaction is the basic protective strategy of most cells ... but can have unwanted side-effects when it becomes chronic. The tears also contain different salts and ions that accumulate when the tear water evaporates. In the tears are additionally several other molecules such as all sorts of functional and regulative proteins. The tear proteins are hydrophilic and thus also like to be associated with water and have a ´water-dragging´, colloid-osmotic effect. These basics were first prominently recognized, experimentally tested and reported by Jeff GILBARD in the 1970s, who consequently suggested a hypo-osmolar tear supplementation therapy, i.e. tears that contain relatively more water and less salts than the normal tears, for the therapy of hyper-evaporative dry eye conditions ... of which we now know, that they in fact represent the by far most frequent (about four fifth of cases) cause of Dry Eye Disease. In the Pathogenesis of Dry Eye Disease, HYPER-OSMOLARITY (inset to the right) is an important SECONDARY PATHOGENETIC FACTOR, that is induced by the PRIMARY PATHOLOGY of a LIPID DEFICIENCY in the tear film with increased evaporation of the aqueous phase of the tears. These Pathologies are based on the BASIC CAUSATIVE FACTOR of a GLAND-DYSREGULATION - in this case: in Meibomian Gland Dysfunktion (MGD). Pathologies of the aqueous secretion, on the other hand, which are not considered here, are induced by a Dysreguation of the aqeuous Lacrimal Gland. When hyper-evaporation has concentrated the hydrophilic particles in the remaining tears this fluid (as shown in the image above), has an increased osmolarity (often termed hyper-osmolarity) that basically exerts a water-dragging force onto the underlying cells and thus sets them under hyper-osmolar stress. The cells react in the only way they have learned to react - they set up their basic protective answer, which is inflammation - as explained in the chapter for Inflammation, because hyper-osmolarity represents a ´danger signal´ for cells. Ocular surface cells that are exposed to hyper-osmolar stress, as occurs in Dry Eye Disease, produce and secrete inflammatory cytokines as an important inflammatory answer as once reported by Steven PFLUGFELDERS group. The inflammatory cytokines can accumulate in the micro-environment of the ocular surface when the stimulating pathology becomes chronic and can then mount a chronic inflammatory reaction ... which potentially brings us back again into the middle of Chronic Inflammatory Dry Eye Disease. This schematic diagram from a 2005 article by members of the OSCB in ´The Ocular Surface´ explains the main steps in the pathogenesis of the CHRONIC MUCOSAL INFLAMMATION of the Ocular Surface in Dry Eye Disease. Due to an alteration of the Ocular Surface Epithelium this will produce inflammatory mediators in order to mount a protective tissue reaction that is intended to get rid of the pathogenic stimulus. From here, a sequence of secondary events is initiated that encompass (1) an elevation of antigen-presentation molecules and (2) of cell adhesion molecules that induce the influx of cells from the vascular compartment into the tissue and paves there destructive way through the tissue, as well as (3) the activation of connective tissue degrading Enzymes (Matrix-Metalloproteinases, mainly MMP9) in the assumed best interest to provide space for the inflammatory protective cells. All of this would be no major problem ... IF the alteration was only acute and not chronically continuing - which is however unluckily the typical case in Dry Eye. Therefore the typical development here is that the intended protective reaction may transform into a chronic mucosal inflammation that is immune-modulated by the lymphatic cells that are a normal protective component of the tissue. Increased cytokine levels lead to downstream activation of stromal cell types and of vascular endothelial cells with immigration of further leukocytes into the tissue and all the unhappy events that occur in chronic mucosal inflammation as described by members of the OSCB in their TFOS Maui 2002 article and in the Ocular Surface Article in 2005. These events include, among a stimulation of lymphocytes of the specific immune system also the production and activation of protease enzymes such as MMP9, that destroy the tissue structure. 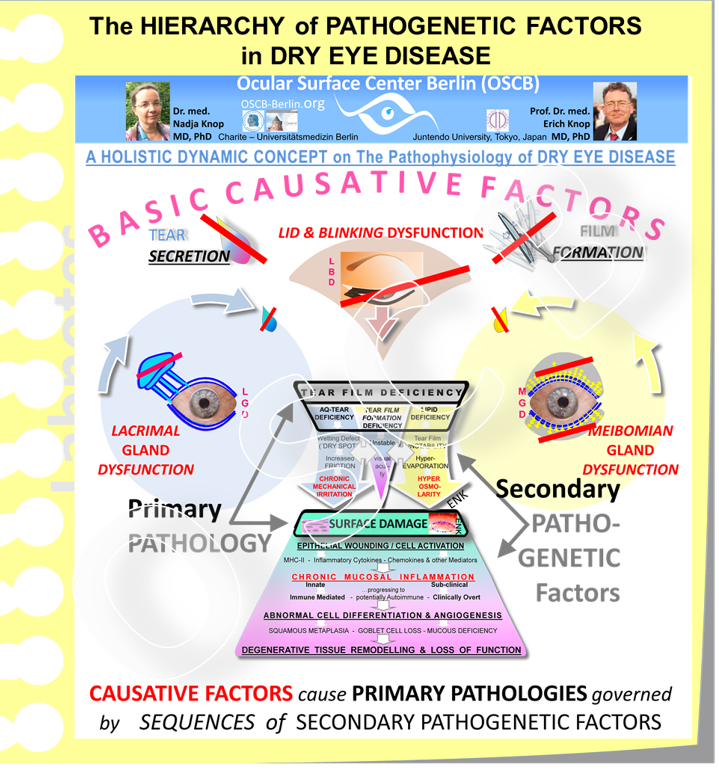 The schematic diagram depicts the pathophysiology in Dry Eye Disease - as it is explained in the new HOLISTIC DYNAMIC CONCEPT on DRY EYE DISEASE. - BASIC CAUSATIVE FACTORS that impair the formation of a stable tear film - either by a Gland Dysregulation that leads to a deficiency of tear components and/or by an impairment of blinking that leads to an inability to form a stable FILM from the available tears - cause the PRIMARY PATHOLOGY of Tear Film Deficiency. This will then, via secondary factors such as the discussed hyper-osmolarity, eventually induce a SURFACE DAMAGE of the Ocular Surface tissue, first of the epithelium, that can proceed to a chronic mucosal inflammation. Even though hyper-osmolarity is certainly an important factor in the pathophysiology of Dry Eye Disease, it is however not a ´Primary´ Factor in the pathophysiology because elevated tear osmolarity always needs something else to occur prior in order to induce it - because the lacrimal gland does not produce primarily hyper-osmolar tears. As explained above and in in the Holistic Dynamic Concept on the Pathophysiology of Dry Eye Disease and in the Hierarchy of Pathogenetic Factors of Dry Eye Disease, the typical primary pathology that leads to the secondary pathogenetic factor of hyper-osmolarity is a deficiency of tear film lipids. Lipid deficiency in turn, is typically caused by the Causative Factor of Meibomian Gland Dysfunction (MGD). After the initial recognition of the importance of a deficiency of tear lipids due to meibomian gland obstruction for Dry Eye Disease, which was reported even before the term ´Meibomian Gland Dysfunction´(MGD) was coined in 1980 by KORB and HERNANDEZ, Hyper-osmolarity had later enjoyed only a limited interest in the following years and was almost ´clinically dead´ by the end of the century. Tear Film OSMOLARITY is an important parameter and an important secundary pathogenetic factor in Dry Eye Disease. The respective measurement can nowadays be done very easily with a hand-held instrument (TearLab) that uses sterile disposable Tips for uptake of tears and can measure the osmolarity very precisely. By this device it is possible to determine a detrimental tear osmolarity simply and directly in the practice besides the patient in a few seconds and to have the degree of hyperosmolarity measured very exactly. In the mid to end of the first millennium decade osmolariy was re-discovered and was soon proposed as a new ´gold standard´ for diagnostics of Dry Eye Disease. This may have been related to the previous problems to measure osmolarity which was only possible with large and heavy instruments that were difficult to use and only available in an advanced laboratory setting. This has changed a lot with the invention of a little, handy and easy to use automated instrument (TearLab) that is nowadays available to measure tear osmolarity very quickly and reliable in the clinical setting, directly besides the patient. The normal tear osmolarity is around or just under 300mOsm/l (milliosmol per liter) and undulates about plus/minus 10mosm around 298 mOsm/l. For orientation, the osmolarity of other body fluids is, e.g 275-320mOsm/kg or very similar for blood plasm and higher, i.e. > 400-500mos/l for urine. Investigations with the TearLab device have shown that a tear osmolarity value over 306mOsm/l is considered a already so elevated that it indicates a Dry Eye condition. Increasing clinical severity of Dry Eye Disease was reported to correlate with increasing Osmolarity values by Piera VERSURA and colleagues and by many other researches. The close correlation of tear osmolarity with the clinical severity of Eye Disease becomes understandable by the strongly irritant effect of hyper-osmolar stress on the ocular surface epithelium as described above.